"I think it's a very complicated operation, technically. And it needs a lot of money, about a billion [dollars]," he said. "So it depends, you have to ask the experts what they mean by quickly. It has a certain schedule. It needs a year, or maybe a little bit more." 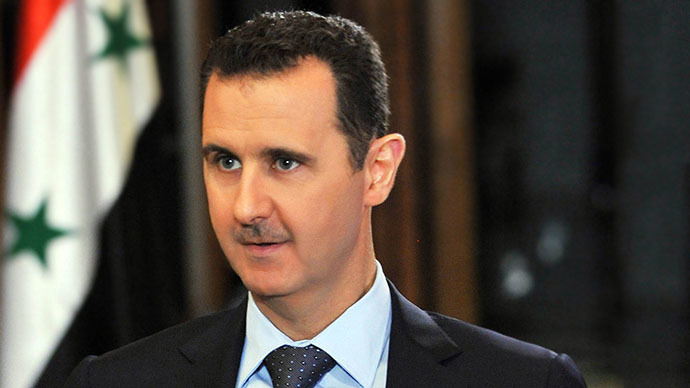 Assad insisted that government forces were not responsible for the chemical attack outside Damascus on August 21. He added that the attack was a violation of international law. "This is despicable. It's a crime." "We have evidence that terrorist groups [have] used sarin gas," he said. "The whole story [that the Syrian government used them] doesn't even hold together...We didn't use any chemical weapons." "The sarin gas [is] called kitchen gas. You know why? Because anyone can make sarin in his house," he said. "We know that all those rebels are supported by governments." "Yeah, there's a misunderstanding that we agreed with this agreement because of the American threat," he said. "Actually, if you go back before the G20, before the proposal, the Russian initiative, the American threat wasn't about handing over the chemical arsenal, it was about attacking Syria in order not to use the arsenal again," he said, referring to a Russian offer to oversee his disarmament. "So it's not about the threat. Syria never obey any threat. We actually responded to the Russian initiative and to our needs and to our conviction," he insisted. "Listen to your people,” Assad said, addressing US President Obama, who has faced wide opposition at home on his plan to strike Syria. “Follow the common sense of your people."